Organizations uncover that one of their greatest assets to inspire loyalty can come from taking people behind the scenes of their brand and history. Every business has someone who is the legend behind the brand – and some are lucky to have that person still working. At large companies, employees can get disconnected from the initial backstory of the company and the greatest opportunity to inspire passion among existing employees gets missed. And this is not just for employees. 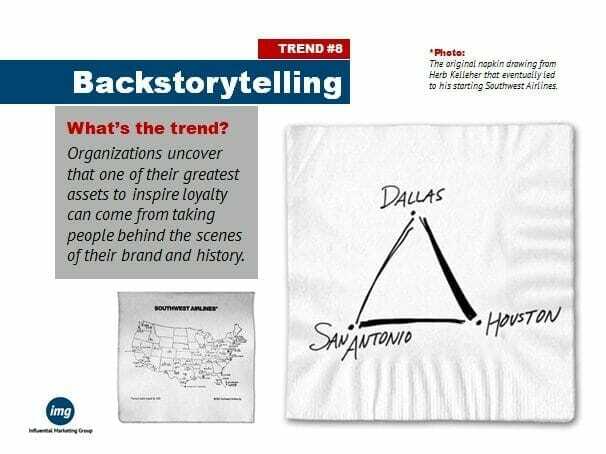 Backstorytelling is bringing these rich company histories back to the forefront, as more brands realize the power of the real stories behind the companies to inspire passion and make connections. Every brand has a backstory and the potential to use it to inspire its customers and employees. Anyone in a leadership role at a company trying to create this sort of passion, or companies looking for a powerful way to drive more loyalty from their employees or customers should care about this trend.